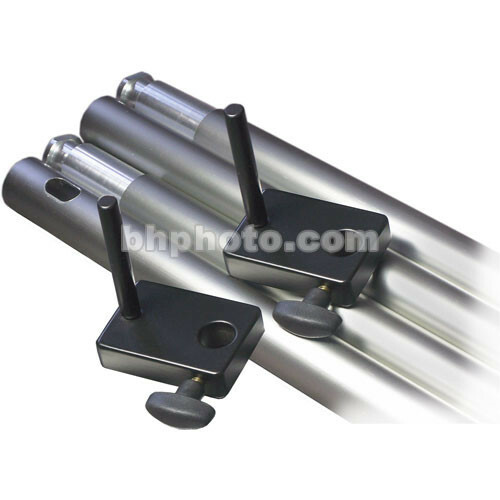 The Photek Add-On Crossbar Kit consists of two background add-on plates and 1 set of SO-4023-4 crossbar kit. This enables the use of two fabric backgrounds on one S4010-4 background support system. The two background add-on plates slide over the existing stud on the SO-4010 stands. These plates have an additional stud form mounting the second crossbar kit. Installation is easy; just slide the 2 crossbar platforms over the studs on your existing Photek background support stands and tighten the locking screws. Assemble the crossbar and install a second fabric background (up to 12' in width). Mount the new crossbar with the background installed over the 2.5" stud on both ends. Add-On 12' Crossbar Kit is rated 4.6 out of 5 by 9. Rated 5 out of 5 by Guy from Must-have Studio Accessory The quality I have come to expect from Photek. This is a must-have accessory for the studio photographer because it allows multiple backdrops to be setup simultaneously. I waited a long time because this item was on back order but it was worth the wait. Rated 5 out of 5 by Tom from Put Two Muslins On One Stand I put two 10 foot X 12 foot muslins on one stand using this Photek kit. The hardware is the usual well made Photek product. This allows me to hang the two back grounds to minimize space and wrinkles and to save time. Rated 3 out of 5 by The Hub from Ok Crossbar, Works Well Works well but I use at full length and it sags in the middle. Would not use with heavy curtain or screen. Also the locking system is easy but not super tight so I worry about it being loose. Rated 5 out of 5 by Pete from Add-On 12' Crossbar Kit by Photek I bought two sets of this, thereby allowing me to combine them into one bar of approximately 18ft for wide backgrounds. Rated 5 out of 5 by Anonymous from Nice option when needing wide backdrop Worked great to extend my backdrop to 18' & 24'.